Our visit to The Embankment was our first ever to Bedford and we loved this little market town, especially the walk along the River Great Ouse. The name Bedford is thought to be derived from the name of a Saxon chief called 'Beda' who settled with his followers (some thirteen centuries ago) where the River Great Ouse was fordable. Today, Bedford is an ethnically diverse town and is home to people from various parts of the world. The town has a picturesque embankment along the River Ouse, a number of shopping centres, a couple of museums and its fair share of pubs and hotels. We stayed at The Embankment, a late-Victorian building and a Peach Pub, during our short break in Bedford. Built in 1891, the Embankment has been a part of Peach since 2008. Peach is an independently-owned group of great pubs, in market towns and villages across the heart of England. This wasn't our first stay with Peach. We had stayed at The Rose & Crown (the original Peach Pub in the centre of Warwick) last year and had loved it. The Embankment with its relaxed and hospitable vibe turned out to be an equally good place to eat, drink and sleep. The Embankment has 20 en-suite bedrooms (doubles with king-size beds, twins & family rooms), all of them unique in character and a few with riverside views. All rooms come equipped with modern amenities. We stayed in Room 102 which was one of the rooms offering lovely views over the Embankment and the River Great Ouse. It was spacious and well appointed. A lovely colour scheme, a little bit of old-fashioned decadence via an antique gilt-framed mirror and some modern touches all came together to give the room a cosy and inviting feel. The bed was comfortable and with its immaculate white linen looked very inviting. The room was equipped with a flat-screen TV with Freeview, radio, free Wi-Fi, a hair-dryer and tea and coffee making facilities. A sitting area near the window turned out to be my favourite spot in the room. The bathroom featured a stunning copper, free-standing roll-top bath as the focal point. Fluffy bathrobes and toiletries from Damana were provided. The room is the perfect size for a couple and I could have stayed in the room happily all evening but we had a table booked for 6:30 pm for dinner, so we went down to the pub. We were seated in a cosy area immediately on arrival. We were given the menu to peruse and after some deliberation and a recommendation from the serving staff, we decided to go with the Veggie Deli Plate for the first course. While we waited for the first course to arrive, we were served a warm mini bloomer with garlic butter and olives. Shortly afterwards the Deli plate arrived and it included Cheddar, spring onion & potato cakes with tomato chutney, carrot & chickpea salad, whipped goat's cheese croutes with crushed peas & broad beans and toasted pitta with spiced tomato houmous. Everything was well presented and perfectly seasoned. For the main course, I chose Spring vegetable Carnaroli risotto (a very flavoursome dish) while Bhavin ordered Sweet potato lasagna with jalapeno salsa. The salsa was packed full of flavour and complemented the lasagna very well. Needless to say, we enjoyed all the dishes. We were so full after the two courses that we had to give the desserts a miss although they were quite tempting. Breakfast the next morning was also a flavoursome affair. In addition to a relatively limited buffet featuring yoghurts, fruits, cereals, pastries and fruit juices, there was the choice of hot breakfast cooked to order. A special mention here goes to the Smashed avocado and scrambled eggs on sourdough which was utterly delicious. I could have it for breakfast every day! Overall, the food was excellent and the service friendly. 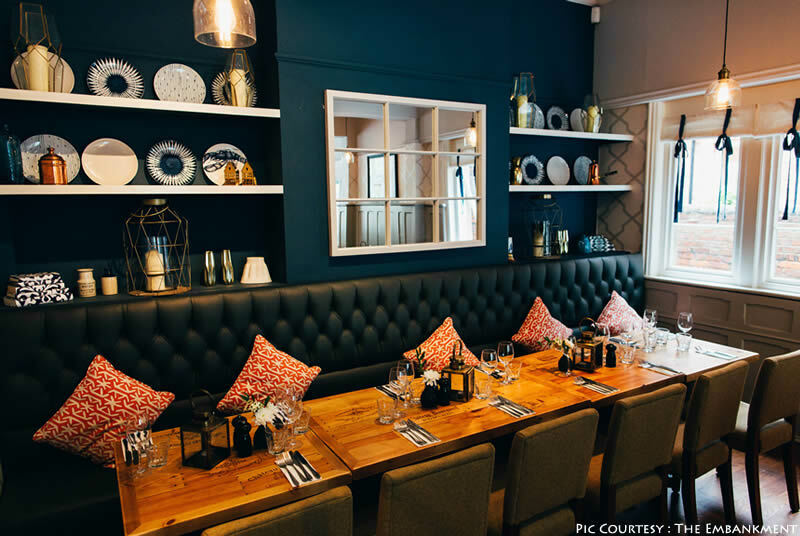 The Embankment is a place where you could come and share a celebratory meal or happily saunter in after your morning walk (with the dog) and enjoy a well-cooked breakfast. The location of the pub makes it both appealing and adaptable to everyone. No wonder it is so popular and busy. The Embankment boasts of an enviable location in Bedford. It is around five minutes walk from the city centre and the riverside location means you can enjoy strolls along the Embankment or visit one of the many green spaces nearby - Russell Park, Priory Marina Country Park. The Bedford Castle Mound (remains of a Saxon castle mound) and its Victorian gardens are also a very short distance away from the pub. Other fun activities include boat rides on the river, a spot of kayaking or rowing on the river Great Ouse. Bedford Rowing Club offers rowing at all ability levels and ages. If you need information on places of interest nearby you will find a number of useful guides and leaflets in the reception area. A little further afield (around 15 kms) are the Woburn Abbey (home of the Duke and Duchess of Bedford) and the Woburn Safari Park which is a drive-in safari with over 1000 different animals. The Embankment is a lovely place for a romantic getaway and is also well suited for a small & intimate wedding party. 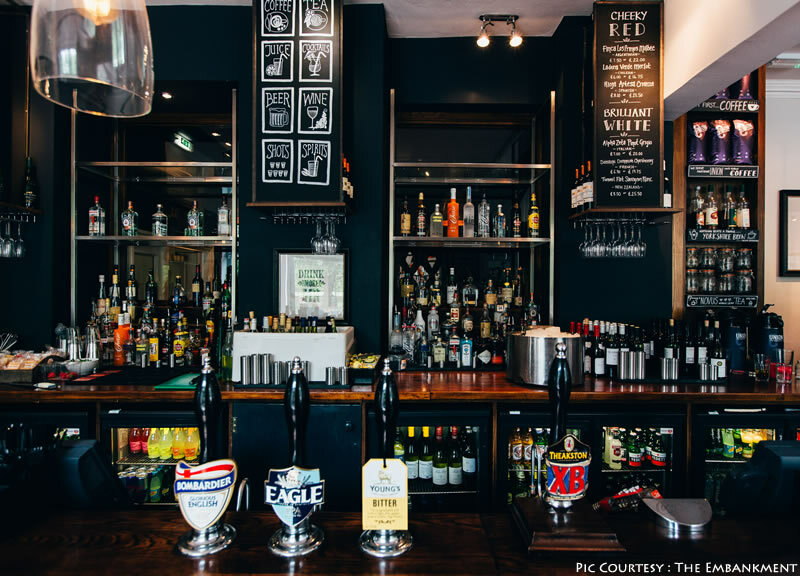 The staff at the pub are a friendly bunch and ensure that guests feel welcome and comfortable. To sum it up, it is a lovely place to stay. If you are visiting Bedford or are looking for a weekend getaway in Bedfordshire, I would recommend you to consider The Embankment as your accommodation choice. Prices for a night’s stay at The Embankment range from £100 to £140 including breakfast (rates based on two people staying in a double room). Book direct to get a better rate! The Embankment has a small car park to the rear of the pub. On street parking (pay and display, 8am-6pm) is also available along the Embankment. *Our stay was complimentary to facilitate this review. All opinions, as always, remain solely our own. That looks so comfortable and welcoming and the food looks wonderful. We're looking for somewhere to spend a night in the area soon so I'll have a closer look at their website, thank you. The food was fabulous and the service excellent. If you do decide to stay there, I am sure you will enjoy your stay. I've never heard of this place, but it looks like an excellent choice. The free standing copper bathtub is lovely, I would have stayed there for a long time. Lovely food by the looks of it too. The copper bathtub was the focal point of the bathroom. Beautiful! Sounds like a great place to stay. I don't think I've ever actually been to Bedford, I definitely haven't been as an adult anyway. I don't associate it with tudor architecture, but the buildings in your photo are gorgeous. The food at The Bedford sounds fantastic as well. This was our first visit to Bedford and it was nice. The riverside walk was lovely. There are a lot of fun activities as well - rowing, kayaking, boat rides etc. I love staying at places with a bit of history associated with them. The embankment seems to fit the bill. The food looks delectable as well. The property seems to have everything going for it since the location looks great too. The building was built in 1891 and thus has a lot of history attached to it. The food was fabulous - everything packed with flavour. the breakfast area seems really nice, a good way to wake up in the morning then. I think one of the more important part is the good service. the location is lovely as well. The architecture and the scenery in Bedford look beautiful. It looks like a great place for a relaxing break. I love luxurious hotels too and the rooms at The Embankment look right up my alley. I've never seen a free standing copper bathtub before either. It is actually a pub with rooms. The accommodation though is very comfortable with all amenities needed for a relaxing stay provided in the rooms. The Embankment seems like a wonderful place to stay. I love the color scheme in the room and the accents are very appealing. The copper bathtub is gorgeous! A good breakfast is important to me and I like the look of the smashed avocado breakfast very much too. The decor and accents in the room were lovely, creating a very welcoming vibe. Yes. the copper bathtub was stunning. What a beautiful building. Lovely to read how much you enjoyed your stay there. I would love to stop in thie fantastic looking pun very Shakespearian looking!